Lakeside 626 Heavy-Duty Stainless Steel Three Shelf Enclosed Cart with Laminate Finish - 28 1/4" x 18 3/4" x 32 5/8"
With added capacity for handling heavier loads, this Lakeside 626 stainless steel three shelf enclosed cart with laminate finish will provide your foodservice operation with a stylish, durable cart for a wide variety of applications. A flat laminate top shelf is paired with stainless steel shelving, making the cart perfect for displays and serving. This item boasts three 18" x 27" shelves with a clearance of 12 1/2". All welded leg angle construction allows for easy cleaning and durable use, while the reinforced 20 gauge shelves, add strength to where the cart is most vulnerable to stress from load drops. 4" swivel casters will maneuver smoothly across nearly any surface. 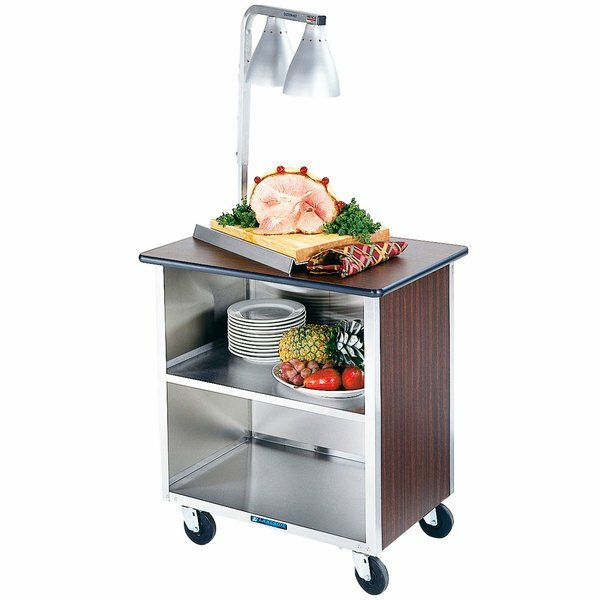 The Lakeside 626 enclosed cart with laminate finish is recommended for heavy-duty use and features a 700 lb. weight capacity.